The inaugural edition of SqueeCon, a celebration of films, art, music, cosplay and more by women and female identifying individuals has been announced. 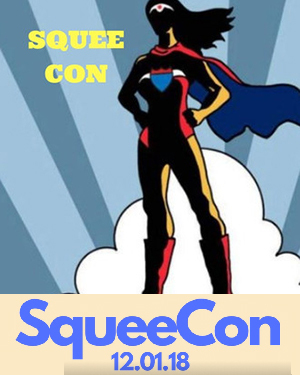 SqueeCon is the first ever one-day event celebrating the arts by a collective of Fangrrls creators and will cover the entire gamut of fandom experience. The event will be held on Saturday, December 1, 2018, at the Lyric Hall, New Haven, CT, between 1-9pm. SqueeCon is pleased to welcome film-makers, nerds, geeks, writers, Fangrrls, cosplayers, vendors and more to join hands in support of the community. Several eminent guests have accepted the invitation to be there, including Christine Evans, Cate Broomhead, Cat Smith, Tea Time For Mad Girls and more. As the very first gathering of creators, consumers, and fans, SqueeCon will cover fandom experiences of Fangrrls, be they cosplay, conventions, comic books, movies, podcasts, fanfic or episodics. All women, girls, femmes and female identifying Fangrrls will get to chat, network and collaborate in this geek-nerd cultural space. As of today, SqueeCon confirms the following schedule: screening of ‘Wayward’, a sneak preview of upcoming docu-series, ‘Looking for Leia’, and the premier of the third installment of the ‘Squee! Project’ web-series. In addition, there will be a program of short films and videos. Well known guests in attendance include ; Cate Broomhead and Christine Evans of The_Cos_n_Effect, Rowena Cosplays, Ayla Ocasio & Jacob Daniel Womack, Jenn Wotchertonks and more. Among the performances, SqueeCon will feature performances by Cat Smith and Tea Time For Mad Girls. There will be panels on Practical Cosplay, with more to be announced, and a Nerd Karaoke/Mixer. SqueeCon expects a wide array of audience and demographics. The expected profile includes women, gender non-conforming and LGBTQ-identifying individuals; age groups from early 20s to late 50s; and fans of pop culture, horror, sci-fi, fantasy, and superhero content, both literary and moving image.